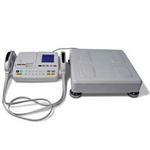 The D1000-1 is a Single Frequency Foot-Foot Body Composition Analyzer. Foot electrodes located on the scale use single frequency bio-electrical impedance analysis (BIA) to obtain lower body composition for analysis of water, muscle, and body fat ratios. This feature-rich analyzer includes a weight scale with 440 lb capacity and internal printer for a custom report of classic body composition ratios and advanced analysis options. These advanced options include Goal Setter and Wrestling modes, ideal for use in clinics, hospitals, fitness/wellness centers, weight rooms, rehabilitation facilities and athletic departments. The D1000-2 is a Single Frequency Hand-Hand Body Composition Analyzer. Two hand-held electrodes use single frequency bio-electrical impedance analysis (BIA) to obtain upper body composition for analysis of water, muscle, and fat ratios. The D1000-2 includes a weight scale with 440 lb capacity and internal printer for a custom report of classic body composition ratios and advanced analysis options such as Goal Setter and Wrestling modes, making the Competitor ideal for use in clinics, hospitals, fitness/wellness centers, weight rooms, rehabilitation facilities and athletic departments. 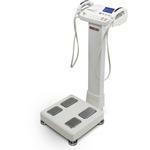 The D1000-3 Competitor is a Full-Body Multi-Frequency segmental body composition analyzer (BCA). Through advanced technology and provided personal data, scale-base and hand-held electrodes use bio-electrical impedance analysis (BIA) to obtain multi-frequency segmental body composition of water, muscle, and body fat ratios. Tailored analysis can be provided based on specific modes such as Wrestling or Goal-Setter. The Competitor Series BCA will enhance any medical or weight loss practice and is well-suited for athletic or fitness facility, instantly complement existing client programs. Multi-frequency segmental analysis is more affordable than ever before, making it easier to upgrade to the most accurate BIA device for even better results and more data. A complete analysis provides detailed information which can be immediately printed with the built-in ticket printer. Analysis can be taken one step further with Body Pass software, providing detailed, easy-to-understand results, charts, and tracking all stored in a client database. Fitness professionals use Competitor Series BCAs to provide clients with the most effective programs and superior results. Goal Setter mode offers users an effective way to establish and track fitness goals. This mode allows the user to select a target body fat percentage. Based on their unique attributes, the Competitor Series BCAs calculate how much weight should be lost to achieve that goal, and the user’s predicted weight and fat mass when the goal is reached. Health care professionals throughout the world rely on accurate body composition analysis for effective treatment programs and outcomes. The Competitor Series BCA is an essential piece of the puzzle, enhancing your practice by offering a complete solution for documenting and analyzing weight program effectiveness. Providing exacting analysis for the most demanding programs and practices, Competitor Series BCAs deliver accurate body composition results needed to define a client’s overall health. Competitor Series BCAs are an ideal fit in any medical setting.